Our ever popular Jack the Joker fundraiser continues this Sunday night in Crotty’s Bar where the jackpot is €7,800 as on Sunday night Shane Hallahan was drawn out of the drum and chose card number 50 which wasn’t the Joker but he did win €50. Joey Mullen and Joe Power won €25 each. As well as our group of ticket sellers tickets can be purchased from Village Flowers, Spar, Mousies Takeaway, Minnies Bar, Abbeyside Post Office and Crotty’s Corner Bar. On Sunday evening last our Senior Hurlers played Dungarvan in the opening round of the County Championship in Fraher Field. It would be fair to say we put in a very disappointing performance on the night as our opponents ran our comprehensive winners. All involved will be acutely aware that a big improvement on this performance will be required this Sunday night when we take on Tallow. TEAM: S. ENRIGHT, E. BRACKETT, S. O’HARE, E. COLLINS, M. O’HALLORAN, J. O’MAHONY, M. POWER, R. FOLEY, J. ELSTED, S.CROTTY, M. FERNCOMBE, S. DALY, P. HURNEY, T. MURRAY, D. McGRATH, N. MONTGOMERY. This Saturday night we play Tallow in our first game of the Western Championship at 7pm in Bushy Park. Our new range of Club Leisure wear has arrived and is proving extremely popular with young and old alike. If you missed out on the gear this time then there’s no need to panic as we will be taking orders in the next fortnight, with dates posted on our website and Facebook page. Our ever popular Jack the Joker fundraiser continues this Sunday night in Crotty’s Bar where the jackpot is €7,600 as on Sunday night Alice Marie was drawn out of the drum and chose card number 34 which wasn’t the Joker but she did win €50. Georgina Crowley and Kevin Halley won €25 each. As well as our group of ticket sellers tickets can be purchased from Village Flowers, Spar, Mousies Takeaway, Minnies Bar, Abbeyside Post Office and Crottys Corner Bar. On Saturday evening last our Senior Hurlers played Roanmore in the County League in Abbeyside where they recorded their second win of the League thanks to a strong second half display. TEAM: S. ENRIGHT, E. BRACKETT, S. O’HARE, E. COLLINS, M. O’HALLORAN, J. O’MAHONY, M. POWER, R. FOLEY, J. ELSTED, S. CROTTY, M. FERNCOMBE, S. DALY, P. HURNEY, T. MURRAY, E. KIELY. This Sunday night we play Dungarvan in the first round of the County Championship at 7pm in Fraher Field. Our U12 team started the Town & Country League with a win in Kilgobnet against a good St. Pat’s side on Friday night last in Kilgobnet. Training continues on Friday nights at 6pm for under U6, U8, U10, U12 and U13s. It is great to see so many new faces every week, new members are always welcome. Please return registration forms as soon as possible to make sure your child is insured. Helmets can now be purchased from the club, enquiries to any of our coaches. Training for U14 and U16 continues on Thursday nights at 7pm. 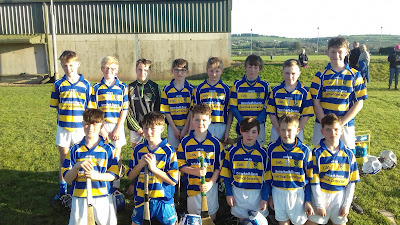 Our Under 14 Championship was due to get underway last night Tuesday 11th away to Tallow, results to follow. Waterford Camogie are running an Easter camp in our club grounds on Tuesday 18th and Wednesday 19th of April from 10am to 1pm. The camp is open to all girls aged between 8/14, price of the camp is €25, to sign up contact Fiona Morrissey 0861793669 or Elena Carmody on 0877379634. Our ever popular Jack the Joker fundraiser continues this Sunday night in Crotty’s Bar where the jackpot is €7,400 as on Sunday night Judy Connors was drawn out of the drum and chose card number 19 which wasn’t the Joker but she did win €50. Emer Enright and Paudie Morrissey won €25 each. As well as our group of ticket sellers tickets can be purchased from Village Flowers, Spar, Mousies Takeaway, Minnies Bar, Abbeyside Post Office and Crottys Corner Bar. On Friday night last we played Stradbally in the first round of the County Championship in Stradbally. On the night the team played some very good football to come away with an excellent victory to advance to the semi final of the County Championship. TEAM: K. DWANE, C. BRENNAN, C. McCARTHY, D. McGRATH, C. McCARTHY, J. ELSTED, C. DWYER, J. BERESFORD, N. MONTGOMMERY, S. CLIFFE, D. LOOBY, T. LOOBY, P. POWER, S. DALY, E. KIELY. SUBS: L. POWER, M. TWOMEY, A. FITZGERALD, R. MANSFIELD, T. COLLINS. Our Senior Footballers got their County League campaign off to a good start on Saturday evening with a good win over The Nire in Abbeyside. We would like to wish The Nire player who sustained a serious injury in the warm up for the game a speedy recovery. TEAM: K. DWANE, C. McCARTHY, P. LYNCH, D. HENLEY, M. POWER, R. FOLEY, J. ELSTED, M. MAHER, J. O’MAHONY, D. LOOBY, M. FERNCOMBE, S. O’DONOVAN, P. HURNEY, J. HURNEY, C. McCARTHY. This Saturday evening our Senior Hurlers play Roanmore in the County League in Abbeyside at 6:30pm.